KUALA LUMPUR (Nov 28): Share prices were mostly lower today, as the poor sentiment on the oil & gas (O&G) stocks spred across the broader market. The O&G counters led the fall, following the overnight news that the Organization of Petroleum Exporting Countries (OPEC) has decided not to cut output to stem the falling crude oil prices. This dashes hope the crude oil prices would reverse its current downtrend anytime soon. Among top decliners were oil and gas counters such as Uzma Bhd — down almost 15% or 37 sen to RM2.13; SapuraKencana Petroleum Bhd — shedding 29 sen or 9.4% to RM2.80; and UMW Oil & Gas Bhd — slidding 36 sen or 11.3% to RM2.83. 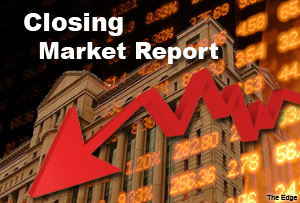 The FBM KLCI fell 0.5% today, to close the week at 1,820.89 points at market close. Week-on-week, the KLCI ended the week 11.76 points or 0.65% higher, compared to last Friday’s closing of 1,809.13 points. Benny Lee, chief market strategist for Jupiter Securities Sdn Bhd, said the decision by the OPEC to not cut output, had a domino effect on the local bourse. “The decision by OPEC had impacted oil prices, which in turn had a negative effect on the index-linked O&G counters, translating to a fall in the index,” he said, adding there is still some downside for O&G stocks in the near-term. For the KLCI, Lee said the index will still be bearish, with a support level of 1,800 points in the coming week. Across the board, a total of 1.87 billion shares, worth RM1.99 billion, were exchanged. Decliners beat gainers at 609 versus 241, while 292 counters were unchanged. Sumatec Resources Bhd was the most actively-traded counter today, with 83.95 million share traded. The O&G stock has given up all gains made earlier, and its share price has fallen 7.3% year-to-date. It closed at 25.5 sen, down one sen.
Regionally, markets were mixed with Hong Kong’s Hang Seng falling 0.07%, South Korea’s Kospi ending 0.07% lower, while Japan’s Nikkei rose 1.23%. According to Reuters, oil prices, oil-related shares and oil-linked currencies all tumbled in Asia on Friday, in the wake of OPEC's decision to refrain from cutting output, despite a huge oversupply. The US markets were closed on Thursday for the Thanksgiving holiday, leaving the spotlight on the OPEC meeting in Vienna, where Saudi Arabia blocked calls from poorer cartel members to cut production to stem a slide in global prices. MSCI's broadest index of Asia-Pacific shares outside Japan fell 0.7%, on track for a weekly gain of nearly 1%, but a monthly loss of about 1.6%.